Earlier this week I read a blog post by Elizabeth Ivy Hawkins, an artist and instructor from Grand Rapids. Hawkins was a presenter at a writing conference I attended in October, and while I missed the chance to attend her workshop, I was glad to learn more about who she is as an artist (and mother) and how she uses her interests and passions to encourage others to explore their own creativity. In her blog post she said, "Here's the deal: The arts are a conduit to tell a story about what it is like to be a human being. That's it. If you are a human being, this stuff called art is for you..."
2.) Realize that we have all been changed by art in some way (through a concert, painting, photograph, play, etc.) and that we should attempt to make room for more of that in our lives. The reality is that this personal creativity project began for me because of the impact of a Broadway play my husband and I attended last month (Finding Neverland). It was a play that profoundly told the story of being human-- of struggling with our own perceptions, limitations and ultimately, even death. Of how beauty can exist in the midst of tragic circumstances-- of how beauty is what keeps our souls alive in the midst of tragic and sad human circumstances. I was deeply impacted by the story and wanted, as Hawkins says, "to make room for more of that [art] in my life." That play made me want to be a better mother, writer and wife. It made me want to encourage my own children towards their curiosities and artistic inclinations, and to embrace the messiness that sometimes goes hand-in-hand with such endeavors. It made me want to confidently share the strands of my own story in bolder ways. So, thank you Elizabeth Ivy Hawkins for so eloquently putting into words what I was feeling in my heart, and what I am attempting to do in my life...in quiet spaces and spare moments. Last Saturday I meandered through the Columbus Museum of Art. Scott and I were in Columbus visiting his mom and had a chance to sneak out for the day to do some fun things together while the girls got to hang out with Nanner (Grandma). We had tickets to the Ohio State football game on that night (Go, Bucks! ), and had some time to kill before the game began. I knew wandering through the Columbus Museum of Art was not on Scott's "want-to-do-list" in the few hours that we were kid-free. For me, well, I needed to do something "creative" to continue my 52-week challenge and the art museum seemed like the most obvious option. I actually told him (kindly!) that I didn't want him to come with me. That sounds so romantic after 13 years of marriage, doesn't it?! "Really, babe," I said. "Stay in the car and just watch a movie or go drink coffee somewhere." I was completely serious. He's a smart guy. He asks the right questions. "Really? So, if I asked you to go trap shooting with me right now, or said you you could drive around in the car by yourself for an hour, what would you do?" I smiled. He knew what that smile meant. Trap shooting would not be my first choice. I would choose a quiet hour in the car at this season of life. "Well....Well...Because I love you...a lot...I would consider trap shooting," I said. "Oh, so you would consider it?" "Uh-huh....But, ultimately, I'd rather be alone for the hour and a half." And, so it was settled. If I would choose a quiet car over trap shooting, he was ok choosing a quiet car over art museum meandering. So, Scott dropped me off at the door (lol!) and I walked in and bought my solo ticket, looking forward to what I would encounter in the next hour and a half. I thought this piece was crazy cool. I love glass art--the vibrancy of color and the experimental shapes. My version of a "selfie". Haha. I'm looking forward to making time. P.S. For some reason my photo captions will not show up (Bah! Blogger technology!)...Sorry... I'm working on trying to figure it out. “I wrote this book in the margins of life…it took 6 years,” said Ann Voskamp, speaking on writing her newest book, The Broken Way. Creativity, for most of us, happens in the margins of life. Even for a New York Times bestselling author, creativity often happens in the margins. Why? Because for many of us, our art, our creative endeavors, they are not our whole life (even though sometimes we wish they could be). For many of us the things we create, or love to do, do not tidily fall into our formal daytime job descriptions. Ann is a mom, first and foremost…to 7 children! And a wife…to a farmer who has a big bustling job. She is a homeschooler, and a missionary and she takes children to doctor’s appointments and out to buy new sneakers and t-shirts when they need them. She makes meals and washes dishes. And in the cracks she writes beautiful, beautiful words. She has filled books that have touched the lives of millions. I know it inspires and encourages me. I’m a mom too. Sometimes I’m a mom who feels like she doesn’t have even one crack of time for the creative things I’d love to do…but, I do. Really, I do. I’m telling myself that as much as I’m telling you. Sometimes we have to get creative about finding the creative margin in our lives. It’s the late hours, the early hours, the hours in the car waiting for a child to finish one activity or another. The five minutes before you walk into the grocery store. The 10 minutes before you pick your 7-year-old up from school, the 24 minutes your 3-year-old watches Sofia the First. It’s 5:30 a.m. and you decide that even though you’ve only slept for 5 hours (because your 3-year old woke you up at 4 a.m. and you couldn’t fall back to sleep) that you’re going to get up and finish that blog post on creativity and margin despite any more futile attempts at getting more shut eye (true story!). My intentional creative endeavor last week was attending an event at our local Chrisitan bookstore. 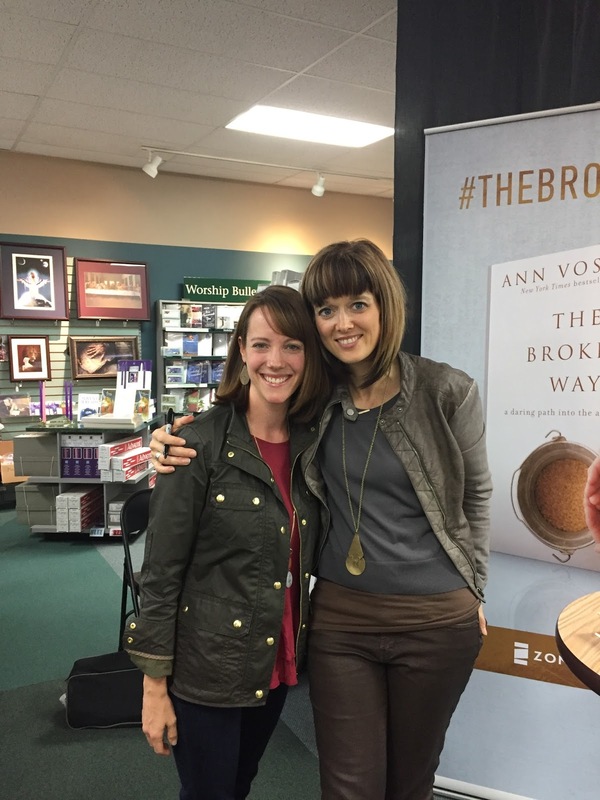 Ann Voskamp, author of One Thousand Gifts and the newly released The Broken Way, was speaking on brokenness, healing, grace and God's great and gracious love. The truth is, 52 weeks of creativity or not, I would have gone to hear Ann speak...she always has something profoundly moving to say. This project isn’t about me doing something “new” all the time, it’s also about being aware of the things I am already doing and being grateful for them. And, quite frankly, I need a grace-filled pep talk. There are days when I feel like the vibrancy of the person I once was has become overshadowed by responsibility and duty. Like I’m not doing one gosh-darned fun thing in my life. Really. I have those little temper tantrums sometimes. I'd like to be done with that. Done looking at life that way. It’s not worth it. It's not one tiny bit helpful. So, this 52 weeks of creativity project is in part an effort to overcome that mentality and pay attention to what, in some cases,is already there. And, in other cases, where I can make room for more. Creativity isn’t [just] crafting; it is any original expression you pursue— running, playing music, gardening, sewing, cooking and so on are all creative acts. Even activities like volunteering and throwing parties are creative pursuits because by giving of ourselves for others we are expressing ourselves in a meaningful way. Moreover, these are activities that inspire us in an indescribable way. And when we make room in our days to include them, we feel more alive and youthful. So this week, I am thankful to have heard from Ann Voskamp, the mom, wife and writer. I am thankful for that night out with girlfriends. I am incredibly thankful that my mom and sister met me at the bookstore and I got to spend some time with them (the fact that my mom was there is a bit of a miracle in its own right, but that is another story for another day). I am thankful for the reminder that creativity, whether it be writing or painting, sewing or singing, running or baking, crafting or collecting, scrapbooking or playing the guitar, can happen in the margins of our lives…and that it IS possible. My margins feel small lately. Sometimes non-existent. I’m learning that finding margin often means ignoring messes, or laundry, paperwork sorting projects, or one of the million other things that I should be doing as an adult, parent, and homewoener. If creatitviy happens in the margins then sometimes it means saying “No” to some of the “shoulds” for a chance to engage in the “coulds”. Instead of asking what “should” I be doing right now, we must allow ourselves to ask “What could I create right now?” Here’s the reality— the “shoulds” could swallow you whole if you let them. So lets let our creative “coulds” have a voice. Yes? So, here’s my challenge, what could you do or create, alone or with a friend or family member, in the margins of your life this week? What would inspire or bring you joy? If you think of something post it in the comments section!